This was mine and Susan's 8th year running Wildwood end to end to celebrate our birthdays, but this year we included Cedar. 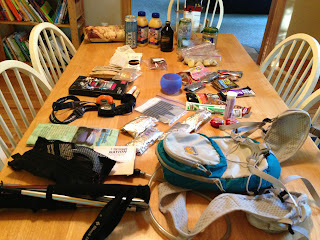 The full Wildwood trail is ~30.25 miles which officially makes Cedar an ultra runner. Most humans don't run 30 miles, let alone dogs. Cedar is a German Shorthaired Pointer, a breed that was developed in the 19th century in Germany for hunting and also known for being able to run long distances. But just because a breed is known for running doesn't mean every dog is capable of it. The Enchantments is probably one of the most photographed areas in the Cascades and there is a good reason. The drama of the sharp peaks of the Stuart Range reflecting in the blue waters of the lake basins makes it hard to take a bad picture. The picturesque beauty has made a popular area even more popular, which makes it extremely difficult to an overnight permit in the permit lottery. Last year John and I got a permit to the Eightmile Lake zone, but there was a forest fire and our pass got pulled. We put a reminder on the calendar for the lottery in 2018, but somehow missed the reminder. When we finally got around to getting a pass we got one for midweek the first week of October for Eightmile Lake. I was happy to have a pass but weather at the beginning of October can be a little iffy. Susan and I took off July 5th to go run in the Mt. Hood Wilderness/Elk Meadows, but left Cedar with my parents because of some potentially dangerous stream crossings and unmaintained trails. He didn't seem to mind, he got to spend the day with his grandmas running around off leash and swimming in the Sandy River. Since our long weekend run was only 2 days after our Elk Meadows adventure we decided to only run 15 miles. I debated taking Cedar with us because he seemed pretty exhausted from 3 days running around my parent's land, but as soon as he realized I was getting ready to go running he had all sorts of energy. I got Cedar's backpack ready and he waited patiently by the door for Susan to show up. I tried to tell him that she is never on time, but he wouldn't listen. Our first day off to run in 2018 (Wednesday, 4 April), and I was thrilled. While on a family hike a month or two ago, I noticed a trail sign with some good distances on it. 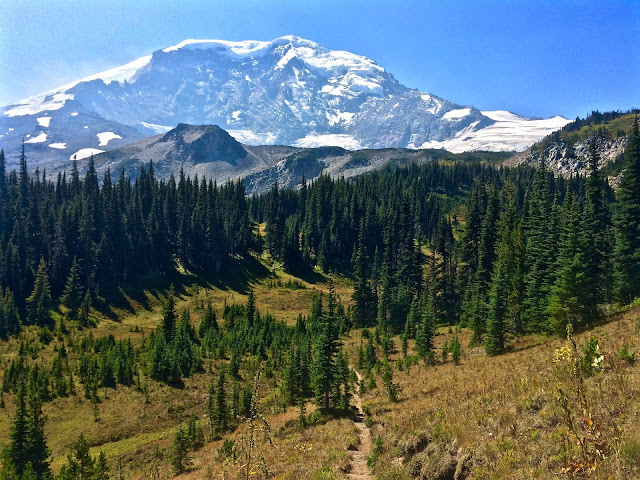 I looked them up when I got home, and discovered the Tarbell Trail-- a 24.75 mile loop in southwest Washington in the Silver Star Mountain and Grouse Mountain area. After lots of research, I was excited to have planned our first adventure since it's usually Ann who does the work. Well now we know why that's the case. After a bunch of rescheduling, we finally settled on Wednesday, 4 April for our run. On Tuesday, Ann called the ranger station and was told that part of the trail was closed for logging and that there was also snow. Last-minute back-up plan: the Wilson River trail. It's a 22 mile point-to-point trail that's safe from snow, we've only run it twice, and it's been three years since we did the whole thing. 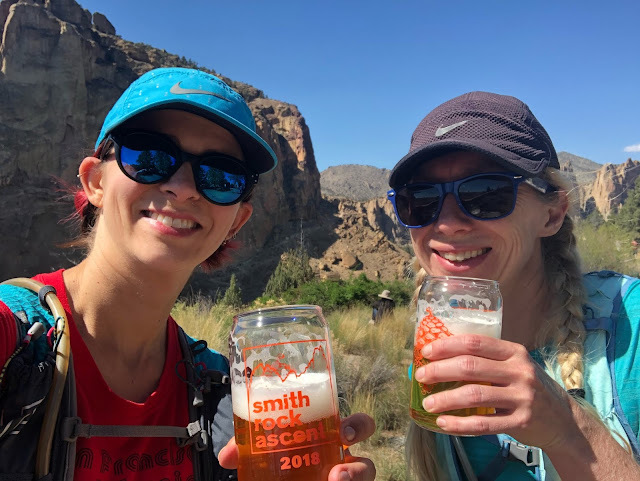 The Smith Rock Ascent 50k was our first race of 2018, it was also my first van camping trip of the year. John and I camped at Skull Hollow Campground, which was ~15 minutes from the start of the race. It was also first come, first served, we lucked out and got one of the last spots. There is camping at Smith Rock, but only for tents not camper vans. We got to Skull Hollow around 3pm, after setting up and settling in we enjoyed a few beers and dinner and watched the sunset from the van. I love van life. The next morning John dropped me off at the start of the race where I met Susan, she was staying in Bend with her family. We grabbed some coffee and took in the views of Smith Rock, since it was our first time there. Shortly after we arrived the race started, we passed Monkey Face and were both amazed how much the rock actually looked like a Monkey Face. Salmon River is our most often run trail, after those in Forest Park. 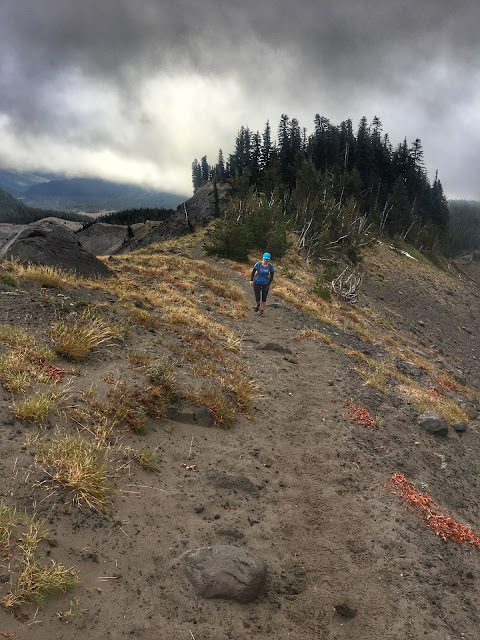 For this run, we started up Green Canyon, to the top of Devil's Peak for the view from the fire lookout, down to Linney Creek on a 5 mile out-and-back, than completed the loop by running the Salmon River Trail. It was a cool and cloudy day that only cleared up for a moment during our lunch break, just down from Devil's Peak. The timing couldn't have been better, because it was one of only two spots where you can see Mt Hood and we got to really soak in the view. The wildflowers were in full form and it was a great spring run.